Thanks to the great efforts being made by the youth of modern India and for the copy of 'The Ocean in a Drop' gifted to me by a friend and mentor, today I can claim to have made a step not toward rebirth but a 're-born' mind of a young person! "You-ng", ... when there is the ecosystem to help you find the 'you' there will be 'natural growth'. Have used the first part of the word for you and the later for the words natural and growth. See how the word young should be understood, and am sure the book will help you find the youth within and ensure that the young get their true place. Often we just read a book, sometimes we do research, we may only do a review, here is one book that though full of facts, is not fiction but a real narrative and i dare say a fast paced read too. 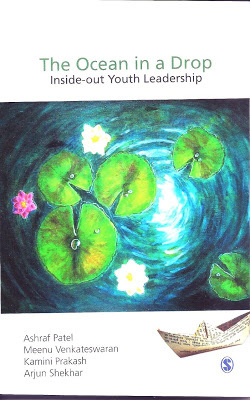 Enjoyed the book cover to cover, and will have this on my desk as a reference and use it as a 'Gita' in my efforts toward helping 'youth engaging society'. Inside-out is what we call real learning and our education system needs an overhaul, as it only provides 'outside' learning. Self-awareness is the foundation of learning, The Drop in the Ocean goes on to quote the Vice Chancellor of Delhi University as saying the learning is only knowledge till you relate it to yourself. He teaches mathematics and he tells his students to apply all he teaches in their real lives and forget whatever they cant. He's right and education should start from the feet and move up to our head, rather than the other way round. Only then does it become learning. Today the most important way we can work for 'youth engaging society' is by ensuring that we trust the young, and have them lead us. Given the space and due ownership of action, the youth will find themselves, all we need is unbiased facilitators who can support young people through the stages of group development. This is beyond handholding and creates the need for quality mentoring, youth must decide and be given the opportunity to lead. The word LEAD must mean Live, Educate, Achieve and Develop. At YES, for us there is not just 'Learning' but it is 'Living' that matters more, and thus our word lead begins first with 'live'. Thank you to the large number of advocates and practitioners who are making the 5th space for the youth a reality, as this will really be the first step to be re-born young!